Lobstros - All hail Lobstros! Lobstros is Lobros' ride. 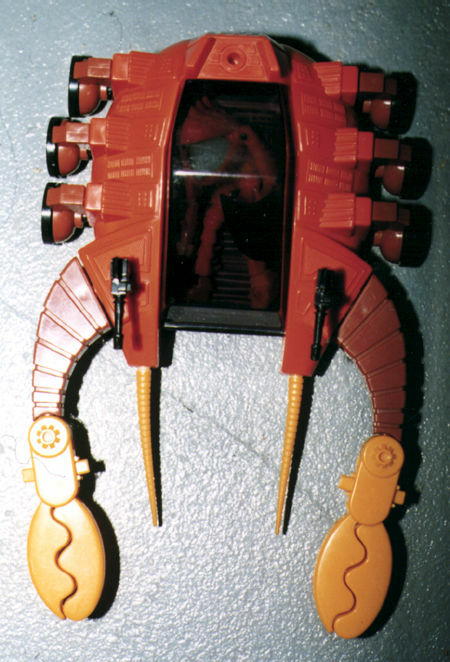 This is one of the rarest of all Micronauts vehicles. It was an Italian release only, although Mego had pitched it as a Pocket Super Heroes vehicle at one time, but that evidently fell through. With the exception of Hornetroid, this is possibly the nicest of the Alien vehicles. Bask in it's glory! And don't forget to check out the downloadable instruction sheet for Lobstros as well! This is a top down view. You can see Lobros guiding the fearsome Lobstros across the cold terrain of Concretus, the planet of concrete in the Basements Everywhere Galaxy! Check out those feelers! Update! 06/08/97 Check out the Focus On section for a complete in-depth pictorial analysis of Lobstros.